Windows 10 monthly quality updates are cumulative, containing all previously released fixes to ensure consistency and simplicity. For an operating system platform like Windows 10, which stays in support for multiple years, the size of monthly quality updates can quickly grow large, thus directly impacting network bandwidth consumption. Today, this problem is addressed by using express downloads, where differential downloads for every changed file in the update are generated based on selected historical revisions plus the base version. In this paper, we introduce a new technique to build compact software update packages that are applicable to any revision of the base version, and then describe how Windows 10 quality updates uses this technique. The endpoints retain the reverse differentials for the software revision they are on, so that it can be used for hydrating and applying next revision update. Historically, download sizes of Windows 10 quality updates (Windows 10, version 1803 and older supported versions of Windows 10) are optimized by using express download. Express download is optimized such that updating Windows 10 systems will download the minimum number of bytes. This is achieved by generating differentials for every updated file based on selected historical base revisions of the same file + its base or RTM version. For example, if the October monthly quality update has updated Notepad.exe, differentials for Notepad.exe file changes from September to October, August to October, July to October, June to October, and from the original feature release to October are generated. All these differentials are stored in a Patch Storage File (PSF, also referred to as “express download files”) and hosted or cached on Windows Update or other update management or distribution servers (for example, Windows Server Update Services (WSUS), System Center Configuration Manager, or a non-Microsoft update management or distribution server that supports express updates). A device leveraging express updates uses network protocol to determine optimal differentials, then downloads only what is needed from the update distribution endpoints. The flipside of express download is that the size of PSF files can be very large depending on the number of historical baselines against which differentials were calculated. Downloading and caching large PSF files to on-premises or remote update distribution servers is problematic for most organizations, hence they are unable to leverage express updates to keep their fleet of devices running Windows 10 up to date. Secondly, due to the complexity of generating differentials and size of the express files that need to be cached on update distribution servers, it is only feasible to generate express download files for the most common baselines, thus express updates are only applicable to selected baselines. Finally, calculation of optimal differentials is expensive in terms of system memory utilization, especially for low-cost systems, impacting their ability to download and apply an update seamlessly. In the following sections, we describe how Windows 10 quality updates will leverage this technique based on forward and reverse differentials for newer releases of Windows 10 and Windows Server to overcome the challenges with express downloads. Windows 10 quality update packages will contain forward differentials from quality update RTM baselines (∆RTM→N) and reverse differentials back to RTM (∆N→RTM) for each file that has changed since RTM. By using the RTM version as the baseline, we ensure that all devices will have an identical payload. Update package metadata, content manifests, and forward and reverse differentials will be packaged into a cabinet file (.cab). 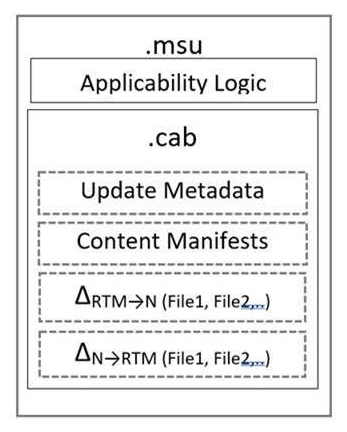 This .cab file, and the applicability logic, will also be wrapped in Microsoft Standalone Update (.msu) format. Once the usual applicability checks are performed on the update package and are determined to be applicable, the Windows component servicing infrastructure will hydrate the full files during pre-installation and then proceed with the usual installation process. Identify all files that are required to install the update. Hydrate each of necessary files using current version (VN) of the file, reverse differential (VN--->RTM) of the file back to quality update RTM/base version and forward differential (VRTM--->R) from feature update RTM/base version to the target version. 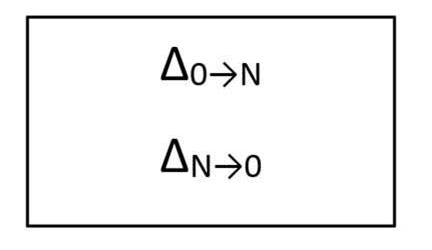 Also, use null differential hydration to hydrate null compressed files. Stage the hydrated files (full file), forward differentials (under ‘f’ folder) and reverse differentials (under ‘r’ folder) or null compressed files (under ‘n’ folder) in the component store (%windir%\WinSxS folder). Resolve any dependencies and install components. Clean up older state (VN-1); the previous state VN is retained for uninstallation and restoration or repair. To ensure resiliency against component store corruption or missing files that could occur due to susceptibility of certain types of hardware to file system corruption, a corruption repair service has been traditionally used to recover the component store automatically (“automatic corruption repair”) or on demand (“manual corruption repair”) using an online or local repair source. This service will continue to offer the ability to repair and recover content for hydration and successfully install an update, if needed. When corruption is detected during update operations, automatic corruption repair will start as usual and use the Baseless Patch Storage File published to Windows Update for each update to fix corrupted manifests, binary differentials, or hydrated or full files. Baseless patch storage files will contain reverse and forward differentials and full files for each updated component. Integrity of the repair files will be hash verified. Corruption repair will use the component manifest to detect missing files and get hashes for corruption detection. During update installation, new registry flags for each differential staged on the machine will be set. When automatic corruption repair runs, it will scan hydrated files using the manifest and differential files using the flags. If the differential cannot be found or verified, it will be added to the list of corruptions to repair. “Lazy automatic corruption repair” runs during update operations to detect corrupted binaries and differentials. While applying an update, if hydration of any file fails, "lazy" automatic corruption repair automatically starts, identifies the corrupted binary or differential file, and then adds it to the corruption list. Later, the update operation continues as far as it can go, so that "lazy" automatic corruption repair can collect as many corrupted files to fix as possible. At the end of the hydration section, the update fails, and automatic corruption repair starts. Automatic corruption repair runs as usual and at the end of its operation, adds the corruption list generated by "lazy" automatic corruption repair on top of the new list to repair. Automatic corruption repair then repairs the files on the corruption list and installation of the update will succeed on the next attempt.